The skid control ecu receives signals from the yaw rate and deceleration sensor via the can communication system. The yaw rate sensor has a built-in deceleration sensor and detects the vehicle's condition using 2 circuits (gl1: g sensor 1, gl2: g sensor 2). If there is trouble in the bus lines between the yaw rate and deceleration sensor and the can communication system, dtc u0123/62 (malfunction in can communication with the yaw rate sensor) and u0124/95 (malfunction in can communication with the deceleration sensor) are output. These dtcs are also output when the calibration has not been completed. 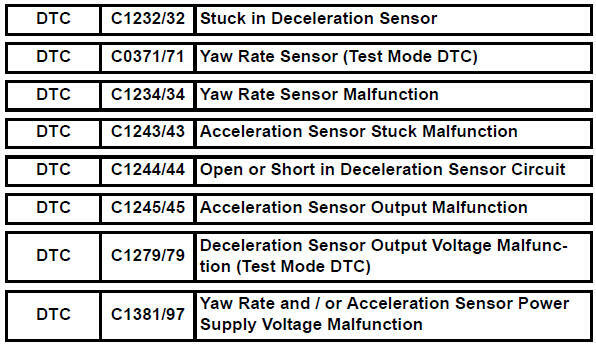 Dtcs c0371/71 and c1279/79 are deleted when the yaw rate and deceleration sensor sends a yaw rate and/or deceleration signal or test mode ends. Dtcs c0371/71 and c1279/79 are output only in test mode. Refer to dtc c1210/23, c1336/39 (see page bc-89). When replacing yaw rate and deceleration sensor, perform zero point calibration (see page bc- 24). When dtc u0123/62, u0124/95 or u0126/63 is output together with dtc c1232/32, c1234/34, c1243/ 43, c1244/44, c1245/45, or c1387/97, inspect and repair the trouble areas indicated by dtc u0123/62, u0124/95 or u0126/63 first. Clear the dtc (see page bc-47). Turn the ignition switch off. Turn the ignition switch on again and check that no can communication system dtc(s) is output. Drive the vehicle at a speed of 30 km/h (19 mph) or more and check that no dtcs are output. Check that the yaw rate sensor has been installed correctly (see page bc-211). Ok: the sensor is tightened to the specified torque. The sensor is not tilted. Disconnect the k6 sensor connector. Measure the voltage of the wire harness side connector. 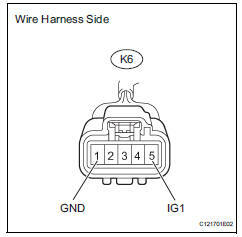 Measure the resistance of the wire harness side connector.